In as little as 24 hours of wearing our Glutathione boosting patch most people are able to experience elevated levels of Glutathione, the body's master antioxidant. Glutathione is so powerful that it is able to naturally detoxify the body, strengthen the immune system and turn back the hands of time with dramatic anti-aging properties. In fact, numerous people have reported that their skin has become more radiant even within a few days of use. These results have never been available before LifeWave. Our Glutathione boosting patch is much more powerful than any other method of elevating Glutathione levels. 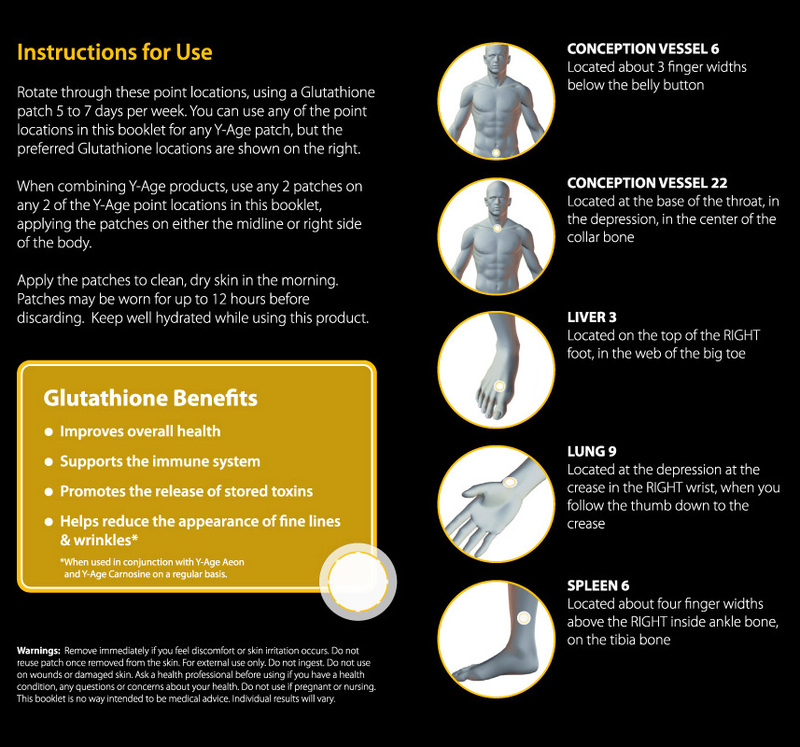 Glutathione is a material that is found naturally in the human body. As we age our bodies levels of Glutathione start to decline, necessitating the need for supplementation. Glutathione is the master antioxidant and plays an important role in our overall health. As we age our body may accumulate toxins; Glutathione protects the body from many toxins we come into contact with every day. As we age we are subjected to numerous heavy metals, in the food we eat and the air we breathe; Glutathione is known to rid the body of heavy metals such as mercury. When we exercise our body uses up its stores of antioxidants; Glutathione is known to improve athletic performance and to help us keep going longer. As we age our immune system becomes weaker; Glutathione can keep the immune system functioning at its peek. There are other Glutathione supplements on the market, but clinical research shows that common Glutathione pills, powders and drinks can only elevate blood Glutathione levels by little more than 10% in 30 days. Because LifeWave technology is capable of triggering metabolic changes within the cells, our Glutathione Booster has been clinically shown to elevate your blood Glutathione levels by over a whopping 300% in just 24 hours! A double blind placebo controlled study was performed to independently examine the effectiveness of the LifeWave Y-Age Glutathione patch in being able to elevate blood levels of Glutathione over a period of 24 hours and several days. Baseline data was collected for all subjects; the average Blood Glutathione levels for all individuals was an average of 2020 umole/L as displayed by the graph on the left ("Normal" value). After 24 hours of using the Glutathione patch, the average blood Glutathione levels of all individuals was 7326 umole/L. This means that within 24 hours of using the Glutathione patch the average increase in Glutathione is over 3 times higher than normal. The graph on the right shows how over a period of 24 hours blood Glutathione levels increase dramatically for LifeWave patch users versus not using the LifeWave Glutathione patch. Blood Glutathione levels have been identified as being one of the most important indicators of our overall health. As the master antioxidant in the body Glutathione has a range of diverse metabolic functions including acting as a free radical scavenger, "recharging" depleted antioxidants back into their active state (Vitamin C, Vitamin E, Vitamin A, etc. ), maintaining the immune system, supporting protein structures and removing heavy metals such as mercury through the liver. Present methods that attempt to elevate Glutathione levels are not very effective. Oral supplements of Glutathione are destroyed by stomach acids. Glutathione is a tri-peptide composed of three amino acids and adding these amino acids to the diet does not guarantee elevated levels of Glutathione. Injections of Glutathione does translate into elevated levels of Glutathione in the blood however this method is undesirable on a daily basis, is expensive and inconvenient. The LifeWave Y-Age Glutathione patches are a new way to dramatically increase Glutathione levels in the body on a daily basis. Our clinical studies show that the average increase in blood Glutathione levels over a 24 hour period is a remarkable 3 times higher than normal. Our patch technology makes elevating Glutathione levels convenient, effective and safe. All active ingredients in the patches are listed under FDA regulations and are recognized as safe. Place one patch 2" or 5 cm below the belly button, use one patch at a time (1 inch is about 2.54 cm). Patches can be worn for up to 12-14 hours before discarding. Remove immediately if you feel discomfort or skin irritation occurs. Do not reuse patches once removed from the skin. Do not use more than one Y-Age Glutathione Booster patch at a time on the body. Keep your body hydrated with water during the use of the patches. May only be worn with the Energy Enhancer and the IceWave patches. This video is an introduction to the benefits of Y-Age Glutathione and Y-Age Carnosine patches. Duration of the video: 8 min. 12 sec. Y-Age Glutathione and Y-Age Carnosine patches are anti-aging products. The video explains their benefits and offers advice on how to use them. Y-Age Glutatione patches were designed to elevate the level of glutathione more efficiently in the body and at a much lower price than through injections or oral vitamin supplementation. Glutathione is the master antioxidant in the body which when elevated can increase the level of other antioxidants in the body such as the vitamin C, vitamin A and Coenzyme Q and act as a strong detoxification agent. Another part of the Y-Age anti-aging program is the Y-Age Carnosine. Carnosine has the ability of protecting and cleaning the inside of a cell. Y-Age Carnosine patches can increase athletic performance. Glutathione and carnosine patches have remarkable anti-aging properties. This video provides testimonials of various customers throughout the world about the benefits of the LifeWave patches. Duration of the video: 15 min. 43 sec. Various testimonials from LifeWave customers around the world. Suzanne Somers, LifeWave ambassador discusses the benefits of the LifeWave patches with David Schmidt, LifeWave CEO (anti-aging, benefits of the patches), Dr. Steven Haltiwanger, MD, CCN, Director of Health and Science Department at LifeWave (studies about the patches), Dean Clark, Director, Clinical at LifeWave (studies), Dr. Karl Maret MD (acupuncture and meridians), Dr. Sherry Greenberg, PhD, Dr. Thomas Budzynski, PhD, expert on biofeedback and heart rate variability (LifeWave patches and physiological responses). Additional testimonials from LifeWave customers in the USA interviewed by Suzanne Somers. 1.- How does the Y-Age Glutathione patch work if nothing enters the body? This is a non-transdermal patch with a new technology that gently stimulates acupuncture points to improve the body's energy flow for improving the quality of sleep. This is similar to the way that sunlight can increase your bodies levels of Vitamin D. No supplements, stimulants or needles are used. 2.- Where do you apply the patch for the best results? The patches will work in many locations. Please refer to the diagrams for placement options in the directions section. 3.- How many patches can I wear at one time? Do not use more than one patch at a time. Best results are obtained wearing one patch only. 4.- How safe are the patches to use? Acupuncture has been utilized for thousands of years as a method for relieving pain and improving the quality of life. While we have shown our products to be safe, if you feel any discomfort at anytime, remove the patches and drink extra water. 5.- Have these patches been independently tested? Yes, clinical research with both blood testing and urine analysis confirm that the Y-Age Glutathione patches dramatically elevate your bodies levels of Glutathione in just 24 hours! 6.- How long can I wear the patch? It's recommended you wear a patch no more than 12 hours per day. Do not reuse the patches. 7.- Can anyone use the Y-Age patches? If you have a health condition or are in doubt please consult your physician before using the Y-Age patches. Do not use if you are pregnant or nursing. 8.- What is Glutathione and what are it's benefits? Glutathione is the body's master antioxidant and helps to detoxify the body and neutralize free radicals while supporting the immune system. 9. - What will I feel when wearing the Glutathione Booster patches? Since Glutathione is an antioxidant, you may feel an improvement in your levels of energy and general well being. Because Glutathione helps to remove toxins from the body you may experience detoxification symptoms such as a sore throat, headache, fatigue or nausea. If this occurs simply remove the patch and drink extra water. 10.- Are there any drugs or stimulants in the patches that are entering the body? No. LifeWave patches do not contain any harmful drugs or stimulants. The patches are designed to apply a mild and temporary pressure to acupuncture points that are known to improve the flow of energy through the body. No magnets or needles are used. 11.- Can I wear the Glutathione Patch with other LifeWave patches? The Glutathione patch may only be worn with the Energy Enhancer and IceWave patches. Do not wear the Y-Age Glutathione patch with the Silent Nights patch, the Y-Age Carnosine patch or the SP6 patch. Shelf life is over 12 months. Close proximity to the body heat can activate the Energy Enhancer patches and decrease the shelf life. Keep away from any living body (human or pets) during transportation. Do not reuse patch once removed from the skin. Do not use more than one patch at a time on the body. Keep your body well hydrated with water during the use of the patches. Ask a health professional before using if you have a health condition. The statements herein have not been evaluated by the Food and Drug Administration. We certify that all LifeWave™ patches are manufactured at FDA registered facilities and in accordance with the specifications in their patent filing. Neither LifeWave™, LLC nor the Nanotechnology store, endorse claims or have scientific proof that it's products are effective in the cure, mitigation, treatment or prevention of disease in man or animal. This product is not intended to be used in the treatment, prevention or cure of disease. Use product only as directed. Do not use product if you have a health condition. Please consult your healthcare professional before using should you have any concerns. The adhesive of our patches is hypoallergenic, however if you experience a skin irritation simply discontinue use. Should any of the contents of the patches make contact with skin simply wash with water to remove. Should you experience any type of discomfort from the use of this product discontinue use. Please review all instructions and information about this product before using.